In a couple of recent conversations, friends have lamented the lack of innovative breakfast options in Melbourne. Cafes have all jumped on the well-stocked bandwagon of baked eggs, dukkah, savoury french toast, labne etc etc. It's all relative, however. A stroll along Glenelg's Jetty Road revealed just how limited a breakfast menu can be, and how homogenous cafes can become. It was a sunny Sunday, so there was no shortage of diners, but their breakfast choices didn't extend much further than poached eggs done hollandaise- or benedict-style; muesli or fruit salad; or pancakes with nothing more adventurous than maple syrup and ice cream. Some venues were even charging extra for eggs to be scrambled. 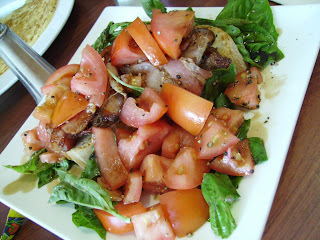 The standard 'gimmick' dish was a breakfast bruschetta, which was the most appealing option to me on Drift's menu. The dish was fine in theory, though suffered a little in execution. The ciabatta's crust was too hard to cut easily, and the bread itself was so fluffy and holey that there wasn't a lot of it! The bacon was the best part of the dish - cut thick and well-cooked without being too crispy. They were generous with the sliced tomato, but it was all a bit much for the bread and a plate of sliced tomato - while no doubt delicious for some - was for me a bit below expectation. Not being an egg man, SG had little choice other than the pancake, and it was ordinary, to say the least. Thin, dinner-plate sized, not particularly sweet, very doughy, with supermarket maple syrup. Wholly unsatisfying. Rather more impressive was the breakfast we stumbled upon at Central Market, after landing at 7:20 am (that is, arriving, not when we left Melbourne, when we landed). 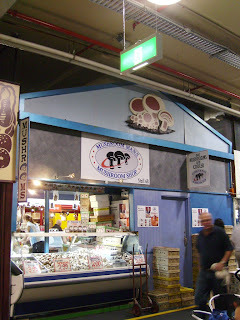 Adelaide's Central Market is on a more manageable scale than the monolithic Queen Vic Markets in Melbourne. 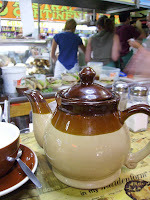 There are a lot more bakers and some shops, such as Grind (teas and coffees), have their main outlets within the markets. The Big Table has been there for years and is known for its takeaway baguettes, which were being prepared with admirable efficiency in the teeny space ringed by counter space on three sides and a kitchen on the fourth. 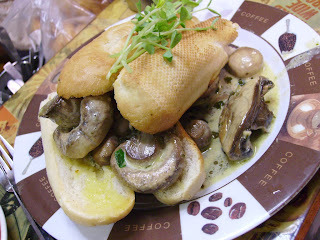 For breakfast I had mushrooms lathered in Big Table's own pesto, on a fresh, crusty baguette. It was just delicious - the mushrooms so earthy and springy, and the pesto creamy enough that it clung to the funghi, but basilly enough that it didn't feel over indulgent. SG chose a winner with a Magic Strawberry Milkshake - it was, indeed, magical. My beverage was chai from nearby Grind - brewed on water, not milk, but spicy enough to still deliver a kick. Not sure if this was the source of the mushrooms on my breakfast dish, but, oh, for one of these at our local shops (that is, a dedicated Mushroom Shop). Returning to the markets later that afternoon for provisions, we visited the Euroasian foodstore, selling both Russian- and Chinese-style dumplings. 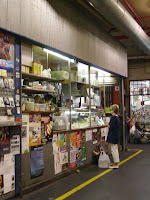 Run by perhaps the sweetest counterhand in the city, we rested our walked-out feet while they steamed up a fresh batch of beef and onion dumplings. 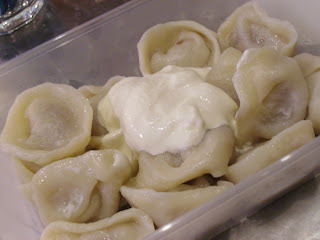 They tasted more interesting than this photo looks, with a winning dough around an acceptable meat filling. The rest of the weekend saw me returning again and again to a market-sourced snack of brioche-style croissant smeared with an extraordinary White Pearl camembert from Tasmanian Heritage, and an astounding caramelised fig paste, flavoured with star anise and fennel.